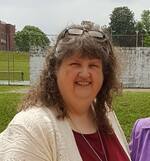 Robin Kay Ensley, age 57, daughter of Patricia Holland Ensley and the late Bobby Ensley, of 762 Spindale Street passed away Sunday at Rutherford Regional Medical Center. Robin was a native of Rutherford County; she was a graduate of RS Central Class of 1979, a graduate of Isothermal Community College and employed by Rutherford County as a tax technician with the Rutherford County tax office. Robin was a woman of various interests and talents. She and her family enjoyed the Mountains of North Carolina and Tennessee having made many friends throughout the region. Rutherford County and Spindale especially held a special place in Robin’s heart. She served the community she grew up in as an elected member of the Spindale Town Council, following in her late father Bob’s footsteps. She was also an appointed member for the Board of Directors of Broad River Water Authority, a member of the Rutherford County Genealogical Society Commission and a lifelong member of Spindale United Methodist Church where she had served on various committees and offices. Robin leaves to cherish her memory her mother and best friend Patricia Holland Ensley along with many other family members and friends. A celebration of Robin’s life will be held at 11 AM Friday April 12, 2019 at Spindale United Methodist Church with the Rev. Angela Burris officiating. Burial will follow in the Spindale Town Cemetery. The family will receive friends from 5-7 PM Thursday April 11 at Crowe’s Mortuary 118 College Avenue Rutherfordton, NC.